In the end of 1960's, two graduates at Case Western Reserve University in Ohio, Harry Pyle and Victor D. Poor, came up with the idea of a high density integrated circuit which would be programmable. They offered this circuit design to various IC manufacturers and were turned down by all of them. The reason? The chip was too specialized and would never have enough widespread applicability to be financially worth developing. Having failed to convince any IC manufacturer, but still believing in the concept Harry and Victor pressed on and went looking for manufacturers who would have an application for the new chip. They found such a firm in Computer Terminal Corporation (CTC) of San Antonio, Texas, which made a variety of lower cost computer terminals which were compatible with the various computer companies and which was involved also in the development of the first microprocessors in other way. CTC was interested in the chip because it presented a way to make one terminal that could be programmed to behave like and handle the protocols of a variety of different computer manufacturers. CTC agreed to pay two different chip makers (Intel and Texas Instruments) to produce the chip. Both chip makers decided to use a new technology, called PMOS, to produce the chip. Both chip makers have encountered new technology problems with PMOS and have failed to meet the CTC deadline. So the contracts are canceled and CTC builds the chip via discrete TTL logic, using about 100 discrete TTL components (SSI/MSI chips), and puts it into a programmable desktop terminal, called the Datapoint 2200. 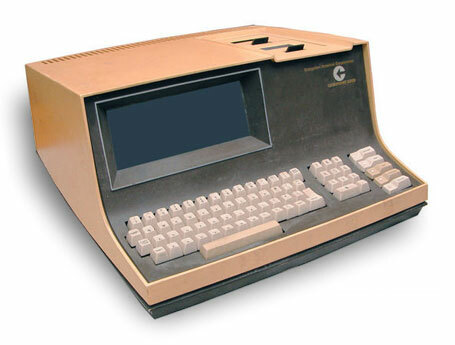 Datapoint 2200 was unveiled in the beginning of 1970 and was launched to the market in May. It becomes an extremely successful product and was manufactured as long as until 1979. So much so, that CTC changes it's name to Datapoint Corporation. They go on to invent another new technology to connect all of their low cost computers together. While the initial Datapoint 2200 did not have a microprocessor in it, it had the programmable equivalent of an Intel 8008 (built by discrete TTL logic) and it funded the initial development of the first microprocessor. The Datapoint 2200 (see the upper image) was a box with size 9 5/8'' height, 18 1/2'' wide, 19 5/8'' deep, weight 47 pounds. It had a small built-in 7'' x 3,5'' CRT screen, which was of green&black monochrome type, and worked in text mode 12 x 80. It had full stroke keyboard+numeric keypad with integrated programmable beeper. The external data and program storage was 2 read-write cassette decks for 130KB of mass storage. Internal memory of the first models was from 2 KB to 16 KB max. There was a run light and 2 other lights on the keyboard. The I/O ports were—RS 232, LAN connector and printer (parallel data) connector. The operating system was Datapoint O/S (cassette/storage drum based O/S). When the machine halted, you could not tell where in the program it had done so. So you put in the O/S cassette and rebooted. You then did a memory dump and tried to deduce what had went wrong. Primitive by today's standards, it was the first computer on a desktop. There were also an optional disk drive using Shugart 8" floppies, single-sided, single-density. It was the first commercial computer to include them! A number of peripherals can be connected also: printer, tape device, 2 MB removable cartridge disk, card reader, etc. (see the Reference Manual). Languages included Databus and Datashare ("COBOL-like" business computer languages, interpreted to allow multiple 80 character by 24 row dumb CRTs to share tiny partitions of RAM memory in the main system unit), a Basic interpreter, and RPG II compiler (see the Programmers Manual).